I’m not sure why, but I’ve always wanted to visit Auschwitz, which is odd, as it’s such a dark and dreary place. On that note, for all my regular readers, I realise that this won’t be the most cheerful blog post I’ve ever written, so thanks in advance for reading :). The experience was as sad as I thought it would be but I am so glad we went. I felt different afterwards. I’m not too sure how to describe it but it really shook me and put perspective on this crazy journey called life. We visited Auschwitz on our trip to Wroclaw. You can read all about that trip here (you really should, especially if you’re a fan of INGLOT). From Wroclaw, you can get a train to Krakow, which is about 3 hours away, and then take a bus to Auschwitz. 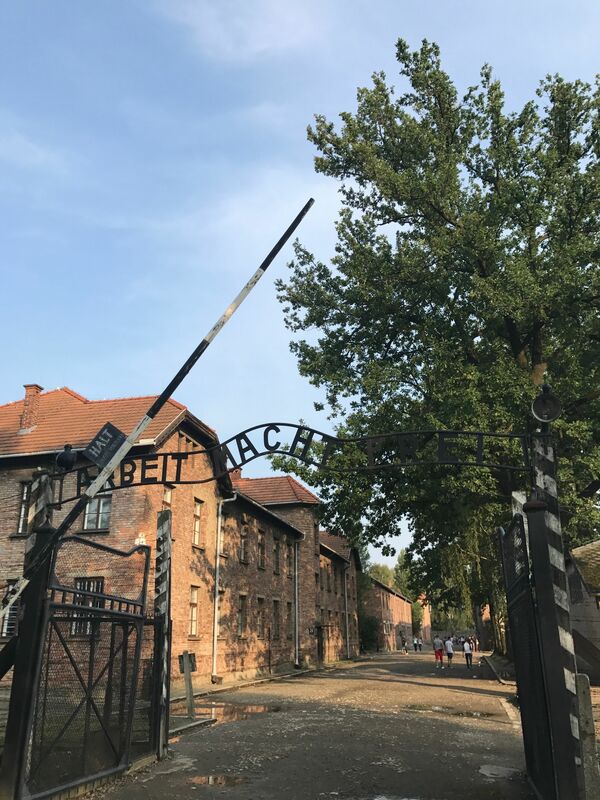 Or you can also go to Auschwitz directly from Wroclaw with a guided tour however we were too late, because I left my phone in an Uber (the usual!). On a side note, Uber’s in Wroclaw are about 50% cheaper than taxis, and if you can remember to take your phone with you when you get out of the car, then they’re hassle-free too. You pre-pay via the Uber app, which means you know exactly how much you’re paying before you even get in the car. You won’t be overcharged by dodgy taxi drivers. Anyway, because we were short for time, we ended up renting a car which took us about an hour and 45 minutes. It cost us about €80 including insurance and a sat nav. The sun shinned all the way on our journey from Wroclaw. When we arrived, the skies opened but it didn’t last. The sun was shinning again after 5 minutes and I remember thinking, how could the sun be shining, why are the birds chirping, the flowers growing, in this awful place! My point being, the rain, hailstones and grey skies seemed more appropriate. Did you know that there are actually 2 camps in Auschwitz? Auschwitz I and II. The second camp is called Camp Birkenau and nicknamed “Death Camp”. It was much prettier than I expected, which is a weird thing to say, but it really was something that struck me. I was expecting grey, cold, dark, damp buildings but instead they looked like the picture below. The gas chambers are still standing, as are the crematoriums. I don’t have any pictures because I felt it would be disrespectful. Each of the buildings was a museum representing different parts of the Holocaust. For example, there was a building showing the sleeping conditions, another showing sanitation, the offices of the generals were in another. The worst part was the buildings that displayed the belongings of the victims; their shoes, suitcases, clothes. There were hundreds of thousands of pairs of glasses and the hair that they shaved from their heads. Again, I didn’t photograph any of this. I did take some photos but not of any of the artefacts, only of the buildings and reconstructed rooms. Auschwitz is a place of remembrance and not a place to take selfies. I found that really bizarre and indecent of people. If you want to see some photos of inside the museums, I recommend following the Auschwitz Memorial and Museum page on Instagram. It was really powerful and extremely emotional. Afterwards, we drove to the second camp, which was about a 5 minute drive. Auschwitz II was in a place called Birkenau, and when we arrived, we both recognised it. This is the place that you see in Holocaust movies; the Boy in the Stripped Pyjamas being the one at the forefront of my memory. The train tracks are so poignant. This is where the victims arrived for “selection”. They boarded the train believing they were being deported (hence the number of suitcases in the museum) but they were being selected for work or death. They were the only 2 options. The thing I found most shocking in Birkenau was the size of the site. There are hundreds of buildings (more like sheds) still standing but if you look closely, you can see chimneys were more buildings once stood. They had more gas chambers here too. I learned about all of this in school, hardly any of the information was new to me, but seeing it in person is a lot different than reading about it in a book. The car journey back to Wroclaw was very quiet. It was awful in parts, but as I said I’m glad we went. As mentioned above, you can read more about our trip to Wroclaw here (it’s fun and light hearted I swear!). You can also watch my travel vlog there which includes some footage from Auschwitz.